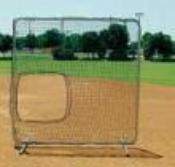 Let your pitcher focus attention on their pitches instead of excessively worrying about being hit by a ball with our Softball Pitcher Protective Screen... HEAVY DUTY 1 1/2" square galvanized steel frame with swaged joints 7' x 7'. 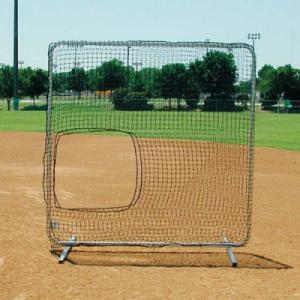 INCLUDES... pillowcase-style double polyethylene net with hole cutout for softball delivery. Legs on the bottom can be removed for easy storage in equipment rooms once practice is over.